just because 71 percent of the planet is covered in water, it doesn’t mean that fresh, drinkable water is accessible to you at all times. In fact, during a crisis, such as a large-scale hurricane, nuclear plant meltdown or societal collapse, the acquisition of drinkable water for you and your family will be difficult or impossible through your normal, everyday access points. This will cause you to think of new ways to secure this irreplaceable asset for your continued well-being—ways that perhaps you have never considered or even thought were possible. The following helpful tips can assist you in having this precious resource always available. Rainwater is one of your best sources of water ... the trick is collecting it. Numerous methods are available, depending on what gear you have access to and what you can salvage to lend a hand. 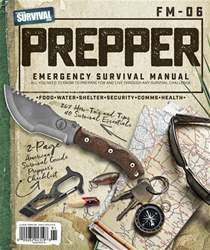 Waterproof items that are part of nearly everyone’s bug-out kit include ponchos and tarps. Use cordage (another must-have in your kit)—either paracord or fishing line—to construct a rain catch. Position the back end higher than the front, with the sides also elevated to create a trough to direct the water flow. Have water carriers ready to collect the runoff, and you’re good to go.